I really enjoyed your article on the New Hudson in the March 2016 issue, good pictures too. 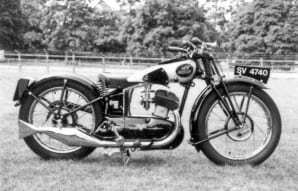 Please receive the small photograph of my 1932 model OI 493cc SV, one of only two to have survived I believe. I restored it about 20 years ago and it is still as good as new. No lights were ever fitted, therefore, it has a different dash panel in the tank. I hope this may be of interest, as information on this machine seems to be far less than for other manufacturers.